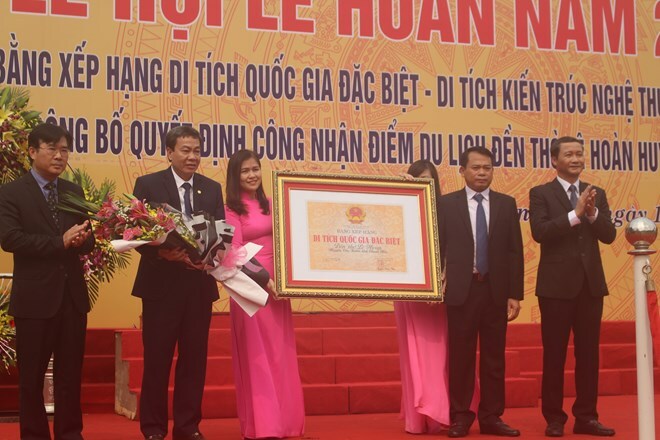 The Temple of Le Hoan – a king of Vietnam in the 10th century – in Xuan Lap commune of Tho Xuan district, the central province of Thanh Hoa, has been honoured as a special national relic site for its special artistic architecture. The special national relic certificate was presented at a ceremony on April 12. The relic site has the traditional architectural style of Vietnamese temples, featuring wooden structures with sophisticated carvings. It is also preserving many antiques like stone steles, royal decrees, couplets, altars, and statues dating back to different dynasties in the country’s history. The temple was recognised as a national relic site in 1990. Le Hoan, posthumous name Dai Hanh Hoang De (Emperor Dai Hanh), was born in 941 in Trung Lap village in the area which is now Xuan Lap commune. He founded the Early Le Dynasty and continued the unfinished national construction process of King Dinh Bo Linh, also known by his posthumous name Dinh Tien Hoang, so as to build a strong Dai Co Viet – the first centralised feudal state of Vietnam – in the 10th century. During the 24 years under Le Hoan’s reign, the country was in peace while people enjoyed a happy life thanks to unprecedented reforms. To pay tribute to Le Hoan, local residents built a temple in his hometown in Trung Lap village of Xuan Lap commune.